"Better not tell your mom about this. She wouldn't understand. You know...man stuff." By now, the fictional character of Crocodile Dundee should be universally known to all. He's that guy who sells Subarus on TV! Oh, he was also a character in a very popular, 1986, feature film. For those of you significantly younger than I, allow me to wind back the clock to the those mid-1980s. It was in this time that, for some bizarre reason, America became suddenly obsessed with Australians. They had given us a hit rock band, Men At Work, and also provided us with that weird, white-haired guy that screamed at us all to buy Energizer batteries. The obvious answer to this thirst for things Australian was the make a whole movie based around one particular Australian man-thing: Paul Hogan, a.k.a. Michael 'Crocodile' Dundee. The movie was a clever, fairly entertaining fish-out-of-water story about a backwoods Aussie hunter, who was brought to New York by a journalist wanting to show him the 'civilized' world. It was a concept landlocked inside the 1980s like other fine, fad-inspired, features such as Breakin', it's philosophical follow-up, Breakin' 2: Electric Boogaloo, and the American Ninja series. 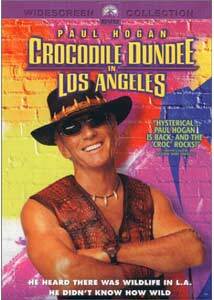 While Dundee was resurrected for a sequel, I honestly thought we had seen the last of the strapping Aussie character, that is until the forces of darkness began to swirl about in their vast abyss and inject the concept of Crocodile Dundee in Los Angeles into some studio exec's head. Someone must have thought that between Paul Hogan's commercials and the new popularity of the unrelated Crocodile Hunter television show, it was time for a comeback. In this third entry in the series, Dundee is still part of the tour guide business in the Australian outback. He still lives with Sue (Linda Kozlowski), and they now have a child together, Mickey (Serge Cockburn). Sue still works for her father's newspaper chain, but when the regional director of the Los Angeles branch dies suddenly, she's asked to briefly take over. Dundee agrees to move the family to L.A., temporarily, and thus, an eerily familiar fish-out-of-water story is born. Once in L.A., Sue uncovers some criminal goings-on at a local movie studio, and Mick Dundee volunteers to pose as an employee there, thus transforming him into a crime-fighter, much like the second Dundee film. Yes, that is the width and breadth of the plot. Pretty much anyone who's a moviegoer, especially one who has seen the previous entries, will see all the jokes coming a mile away. We already pretty much went down this route and repeating the whole thing again makes for a very bland, lukewarm experience. It's not bad, and it's not good, it's just extremely uninspired and lacks any noticeable effort. The first entry at least had the benefit of some clever moments, good character actors, and gorgeous cinematography. Dundee 3 looks shoddily like a straight-to-video piece and has virtually no impressive production values. The brief moments spent in Australia are filled with nods to the older films, including bit appearances by a few of the old cast members; after that, we go through almost all the same things again. Mick Dundee can't use a television, or a cel-phone, or deal with city folk, ad nauseam etc. Didn't we cover this already? I mean, considering he's been living with a wealthy socialite like Sue for over 10 years, this seems a bit ridiculous. I mean, in 2001, Dundee won't know the meaning of the slang term 'gay?' This screenplay is about 10 years too late. To be fair, though, a few gags and scenes are fairly amusing. If there is a good thing I can say about this misdirected comedy, it certainly is family friendly. The humor is pedestrian enough that it shouldn't offend the average person, and there is a strong portrayal of the relationship between young Mickey and his father, which is handled very admirably. The violence and crime-fighting aspect is handled very mildly and cleanly, and there's nothing that can be taken very seriously. A decent comedy probably could have been made, had the filmmakers not been so keen on trying to remind everyone of the funny stuff in the previous adventures, but at least it's amusing without being cruel or toilet-minded. In fact, I think this would have fared much better had Dundee, Sue, and Mickey just stayed in Walkabout Creek and the story had dealt with some simple plot right there, especially since the strongest portions of the film are in those first 15 minutes. Image Transfer Review: The image is about what you'd expect for a brand new film released this same year. Colors are wonderfully combined and rendered in the scenes that really use them, though sadly the cinematography isn't very strong on a regular basis. Fine details are easily visible and there are no digital intrusions of any kind, even in the most artifact prone scenes. The print itself is pristine, with no signs of any physical damage or problems. The image should definitely please fans with a rock-solid, crisp transfer. Audio Transfer Review: A reasonably dynamic Dolby 5.1 track offers some audio excitement here and there. The front soundstage is used well for all sorts of stereo effects and directional dialogue, while the surround channels enhance Basil Poledouris' musical score and offer occasional split sound effects. The channels are used pretty much wherever an opportunity presents itself. The clarity is very good and everything is loud and undistorted. The 2.0 audio sound very much like a down-mixed version of the 5.1, with similar effects, but not as clear. Extras Review: Other than a trailer, there is a 12-minute promotional featurette highlighting the making of the film. It features interviews with cast and crew, and a lot of footage from the movie itself, making it almost like a Cliff's Notes version of the actual film. It's kind of sad to see the Crocodile Dundee franchise having come down to this. With some more effort, I think the filmmakers could have made something that would have appealed to much broader fan base, rather than just the feature equivalent of a TV sitcom pilot. Although a good family comedy, it's simplicity is also a bit on the insulting side. Surely family entertainment does not always have to be at the expense of not being intelligent.